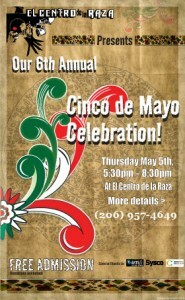 El Centro de la Raza is hosting their 6th Annual Cinco de Mayo Celebration next Thursday, May 5, from 5:30 to 8 p.m. Activities will include children’s arts and crafts, traditional Mexican foods, arts and crafts from local vendors, a health and services fair, a desfile cultural/cultural dress fashion show, performances by the Seattle Fandango Project and Ameyaltonal Danza Azteca-Chichimeca, and more. Admission to the celebration is free, but donations are welcomed. Models are needed for the desfile cultural dress fashion show. 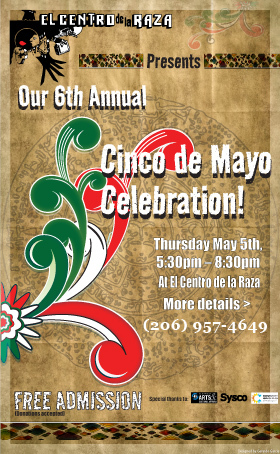 If you’re interested in wearing a Mexican folkloric outfit for the celebration, contact Hilda Magaña at 206-957-4627 or at hmagana@elcentrodelaraza.org. No experience necessary. El Centro de la Raza is located at 2524 16th Avenue S.